The Frick Mansion, Clayton; The Bayernhof; and Millionaire’s Row—Pittsburgh has seen its share of mansions, but it has never seen the likes of the 34-room Bell Acres mansion built by businessman Joseph Nocito Sr., the former CEO and President of Automated Health Systems Inc. The Pittsburgh-based company administered public health programs for state and local government, and Nocito was indicted in 2018 by a federal Grand Jury on charges of conspiracy and filing fraudulent income tax returns. 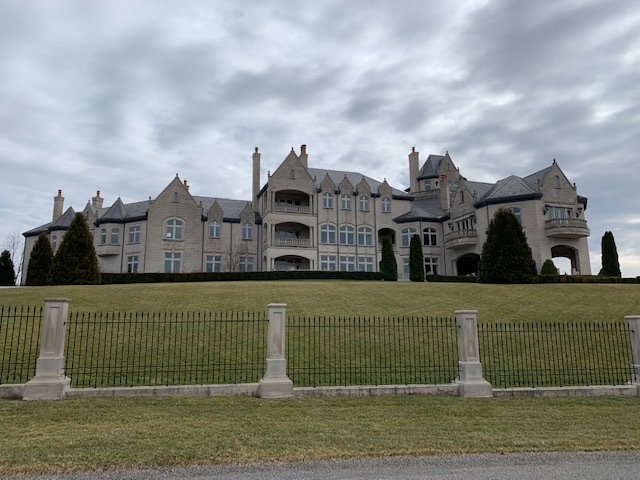 Whether Nocito is found guilty or not remains to be seen, but what we can be sure about is that this house is the biggest in Pennsylvania at 39,000 square feet. The three-story mansion has 12 bedrooms, 13 bathrooms, eight half baths, and 22 fireplaces. On the expansive grounds outside the massive stone home are fountains and gardens, a swimming pool, basketball court and tennis court. Experts value the home at $20 million. The estate is so large, passengers flying in and out of Pittsburgh have noted its size. Although the U.S. Attorney’s Office won’t confirm it, it has been reported that federal agents flying over “Villa Noci” were so amazed by the size of the property that they began investigating and that led to the launching of the federal investigation into Nocito’s financial dealings and his indictment.